The dangers of not vaccinating are horrifying and graphic. Government warnings must show that - Canada Eh? But if raising vaccination rates is a priority, and the dangers of not vaccinating are so pronounced, why are the government’s immunization campaigns so milquetoast and flaccid? For a developed country, Canada has some of the worst child vaccination rates in the developed world. 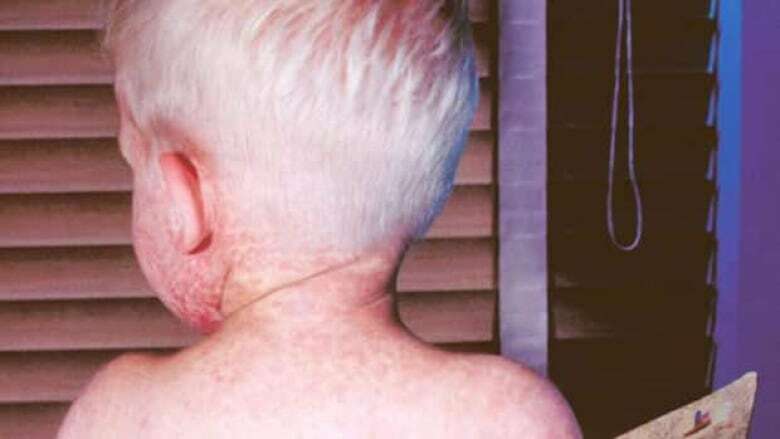 The Organisation for Economic Co-operation and Development (OECD) estimates that 91 per cent of Canadian children have been vaccinated against diphtheria, pertussis and tetanus (DTP) and 89 per cent against measles. These numbers may seem reasonable, but that means nearly 10 per cent of our childhood population remains vulnerable to a host of preventable diseases. Contrary to our smug attitudes about superior Canadian health care, this actually means we trail the U.S. in both measures. Worse still, there is little indication that things will improve. In fact, vaccination rates have fallen so low in certain areas of Canada that children no longer have herd immunity — protection from outbreaks due to sufficient community vaccination levels. This is likely why individual cases of conditions such as measles have prompted outbreaks in recent years. The situation poses a serious public health concern, which explains the impetus for the federal government’s allocation of several extra millions of dollars to promote vaccination to the public. Yet a review of the materials (guides, posters, infographics, fact sheets, videos) available through dozens of federal, provincial and medical association websites generally shows two types of canned packages: walls of text, and/or pictures of smiling kids, parents and doctors. Somehow, Canada has managed to find the most predictable and mundane way to deal with a burgeoning public health crisis. Worse than the sin of being boring, however, is that such an approach is unlikely to work: to change minds or convince skeptical parents to have their children vaccinated. If a wall of text spouting dry facts was effective in countering ignorance and celebrity advocacy, then pseudo-science wouldn’t be part of the cultural zeitgeist. And pictures of smiling parents, children and doctors is so cliché that one could be forgiven for thinking the websites are peddling housewares, rather than life-saving advice. Strangely, the federal government and its partners have overlooked the example set by a wildly successful public health campaign: that of anti-smoking. As noted by researchers in The BMJ, health warnings on cigarette packages that are “graphic, larger, and more comprehensive in content are more effective in communicating the health risks of smoking.” This speaks to the human side of public health – emotionally evocative ads and personalized stories work best. Canada is a leader in this regard. Imagery used on domestic cigarette packaging – of decaying teeth, diseased hearts, blackened lungs— is extreme enough to scandalize those from other countries. Yet a similar commitment to shocking people into action is nowhere to be found when it comes to vaccination. This is especially baffling considering doctors have numerous compelling stories highlighting the danger posed by childhood diseases. For instance, as a pediatric resident in Saskatchewan, Dr. Jeanty examined a five-week-old twin suffering greatly from pertussis, more commonly known whooping cough. Whooping cough in babies is very serious, with complications including seizures, breathing stoppages, pneumonia and brain damage. In this case, the twin had to be intubated, meaning that a tube had to be shoved down her windpipe, and then put on a ventilator just to ensure that she had enough oxygen to survive. And that’s the lucky baby – her twin had already died. The parents were not at fault in this case: the babies got sick just ahead of their scheduled vaccine for pertussis at two months of age. But the twins came from an area where vaccination rates are poor, where herd immunity is non-existent and outbreaks are deadliest among the most vulnerable. Even though the parents did nothing wrong, they suffered the consequences of our collective failure on vaccination. This example is a dark one, but vaccines are not about smiles and improving quality of life. It’s about preventing children from dying or suffering and transmitting disease to others. When parents engage in fence-sitting and delay vaccination, they aren’t being cautious, they are exposing their kids and others to conditions that can kill. This is not hyperbole, this is fact: parents may be shocked to see how many possible complications of vaccine-preventable childhood diseases include death. Seeing that in a bullet point on a fact sheet is easy to overlook – the personal story of a mom who had to say goodbye to her five-week-old baby is not. If the government is serious about tackling low vaccination rates, real doctor and patient stories of loss and suffering should live side-by-side with public education on herd immunity and how pandemics start. The consequences of failing to vaccinate, both on families and in communities, should be made clear through increases in emotional and graphic public service announcements directed where Canadians are already looking, including the airwaves, print and online, rather than in reference literature. The anti-vaccination movement persists, in part, because its spokespeople appeal to emotions — to fear — better than the current government campaign. As a result, parents and up fearing “complications” from vaccines — debunked associations with autism or mercury poisoning — instead of the things they should actually be worried about: their children succumbing to debilitating and deadly diseases. Diseases that are preventable. The Canadian government should get serious and modify its vaccination campaign, even if it means scaring parents into visiting their family doctor or pediatrician to learn more about the real dangers of failing to vaccinate. All the government requires is the courage to move beyond insipid clichés. Hopefully, they find it before more children get sick, or worse.